David Jones is Design Director and co-founder of Bulkhead Interactive where he worked on The Turing Test and Battalion 1944. 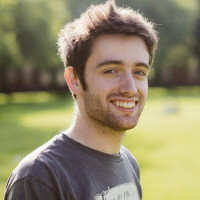 His games industry career began releasing independent games in 2013. David has been part of the team growing Bulkhead Interactive from a small 4 person independent developer to a 30 person studio creating ambitious multiplayer FPS games. Bulkhead Interactive that started as 6 University graduates 5 years ago. Now they have over 20 developers in their studio. They have released two first person puzzlers and then gone on to create 'Battalion 1944' a back to basics WW2 FPS game. Their Studio Lead Joe Brammer will be talking about the challenges and decisions they made when striving to make bigger and better games, leading to their ultimate goal of making their biggest challenge yet; a first person shooter. Those interested in how to take your indie studio to the next level and grow to new heights will leave this talk with an understanding of what worked and what went wrong for Bulkhead Interactive. As Bulkhead Interactive is built up of graduates and with an average studio age of 26, if you're a University student or a graduate there will be a lot of relevant information in this talk for you.